I think we've covered the methodology for interpreting this kind of chart frequently enough that we can dispense with any explanation. 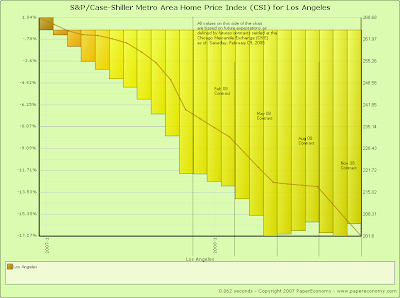 The net-net is that the S&P futures market is predicting that real estate prices are set to drop in the an additional 16-17% in 2008 in the LA/OC market. With the current median selling price at just under $600,000 for the median existent SFDU in OC, that means that we can expect to see prices drop an additional $100,000 for a median EOY 2008 price of just under a half-million dollars. I will write more on this topic later, including the fact that these S&P number align very-closely with reader-poll-derived predictions from this blog, but I have to head out to Costco and pick up a bottle of Dom for me and Mrs. HB Bear. We have some celebrating to do.